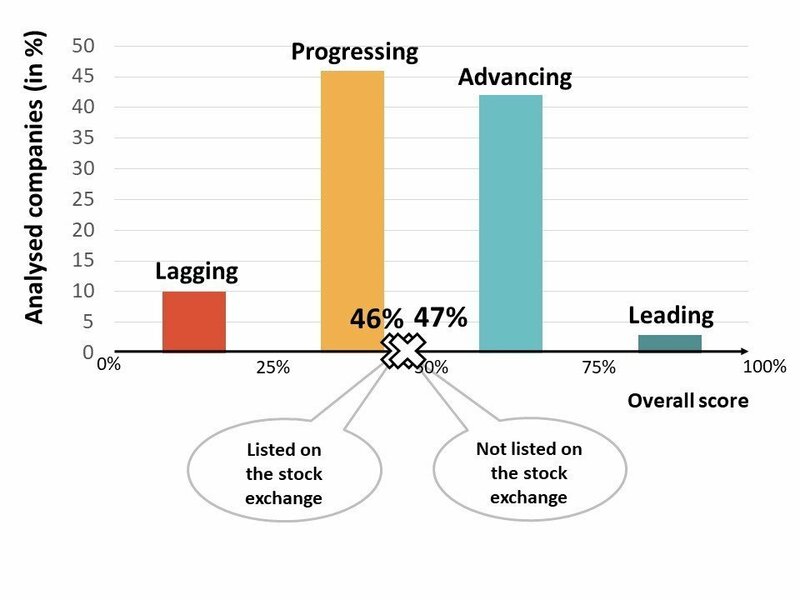 The majority of companies are in the mid-range, with 46 companies reaching between 25% and 50% of the achievable points (progressing) and 42 companies between 50% and 75% (advancing). 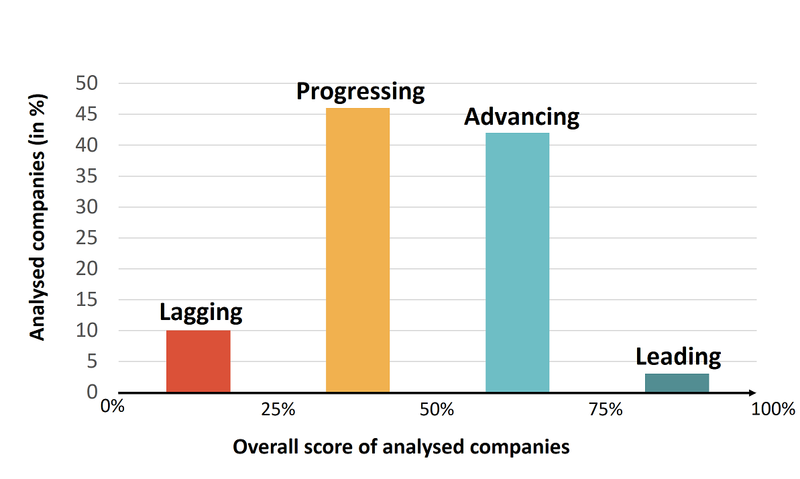 10 companies are lagging, by reaching less than 25% and 3 companies are leading, by exceeding the threshold of 75%. The overall score of companies has been compared between different company sizes and sectors as well as listed vs. non-listed companies. 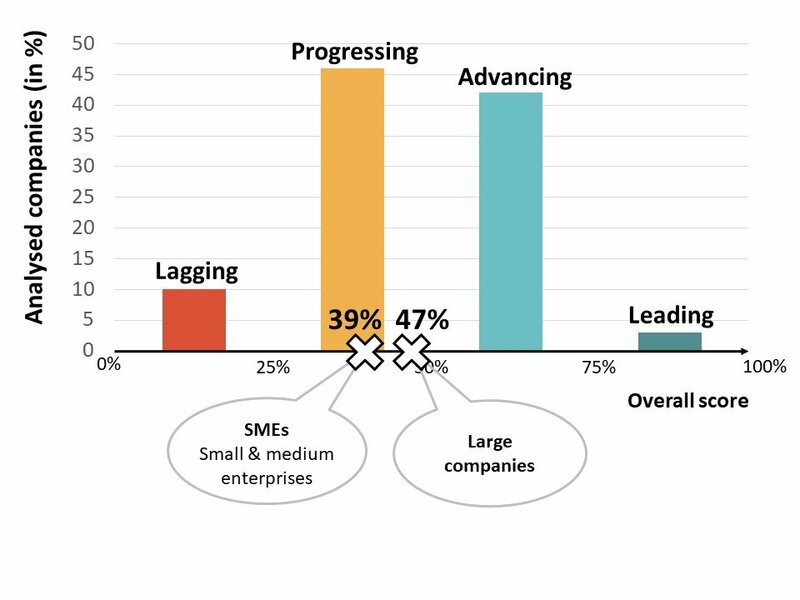 Large companies score on average 47%, which is 8% higher than the average score of small and medium enterprises (SMEs). ‘Other service providers’ (incl. telecom, software, consultancy and marketing services & public logistic company) reached the highest average score with 56%, scoring 21% higher than the real estate sector. There is only a 1%-difference between the average score of listed and non-listed companies. Among the 2017 leaders are the multi-national group Nestlé S.A., the European market leader for sanitary products, Geberit International AG, and the Zurich-based SME Menu and More AG. The Vevey-based multinational company sets itself sustainability goals that are impact oriented and time-bound. Though it covers all relevant industry and global issues, the company can still improve by reacting to critical press articles, e.g. on water or palm oil. The company distinguishes itself above all in the area “credibility of sustainability priorities” and in particular through its stakeholder orientation, which is ensured via a stakeholder panel and the transparent disclosure of a panel statement as well as the company’s response. Since its participation in the first round of the project in 2014, the children’s and youth food catering provider has worked intensively on the further development of its sustainability management, which is clearly shown in the report. 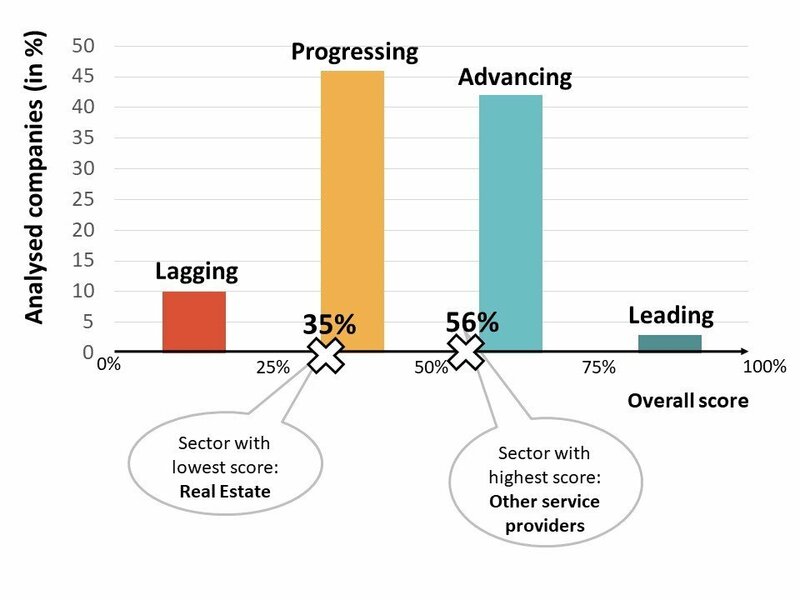 On average, all sectors score around 47%, with other service providers scoring highest with 59% and real estate scoring lowest with 35%. The sectors scoring above 50% – hence those classifying as ‘advancing’ sectors – are other service providers, construction, gastronomy & hotels, retail & wholesale trade as well as the chemistry & pharmaceutical sector.